To say that I am a blessed man would be an understatement! I went out this morning to my stand at Keyser's Ridge.Sunrise is earlier now that daylight savings time came. I got in my stand extra early and heard what turned out to be a buck chasing does already! They were not ready so they just ran off but a picture of him appeared on my camera running after the does! I heard running everywhere! 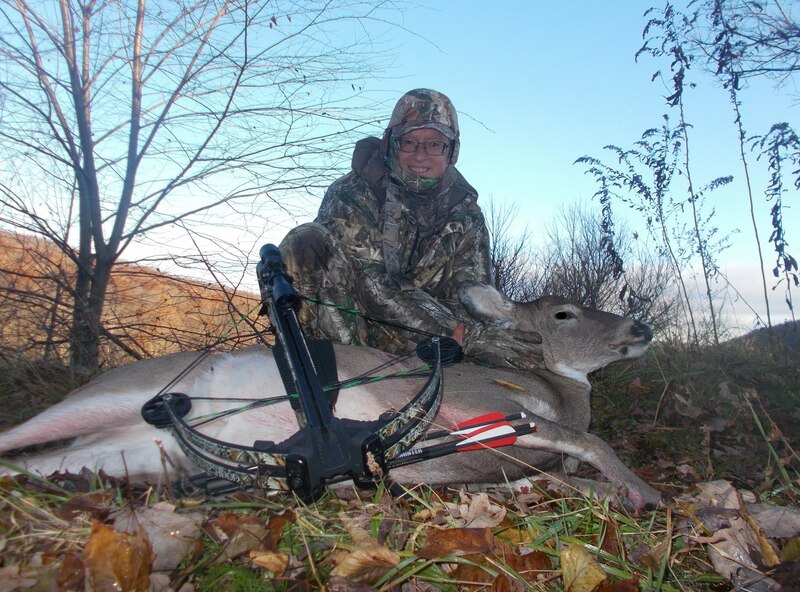 As I was watching two does below my stand, I noticed movement in the form of a nice doe coming in from the field around 50 yards out in front of me.She approached the stand and turned broadside and I took the shot. She bolted down the hill and disappeared. I got down and eventually picked up the trail she took. The hit was good going in as can be seen, but unfortunately it nicked some guts coming out. At the point of impact there was no blood or hair. The fletching had light green on it and it smelled like guts. I walked down the hollow where she ran to and after around 25 yards I was able to pick up a rather healthy blood trail;. She still probably went another 100 yards but I carefully followed the blood trail. Sometimes I had to stop and search for a few minutes but each time I eventually found it again. I saw where she had bedded down so I stopped for a awhile and drank some coffee and then continued following the blood trail. Shortly after, I found her! Wow, this was deer number three for me this year! Plenty of deer bologna and butterfuly chops on the grill! 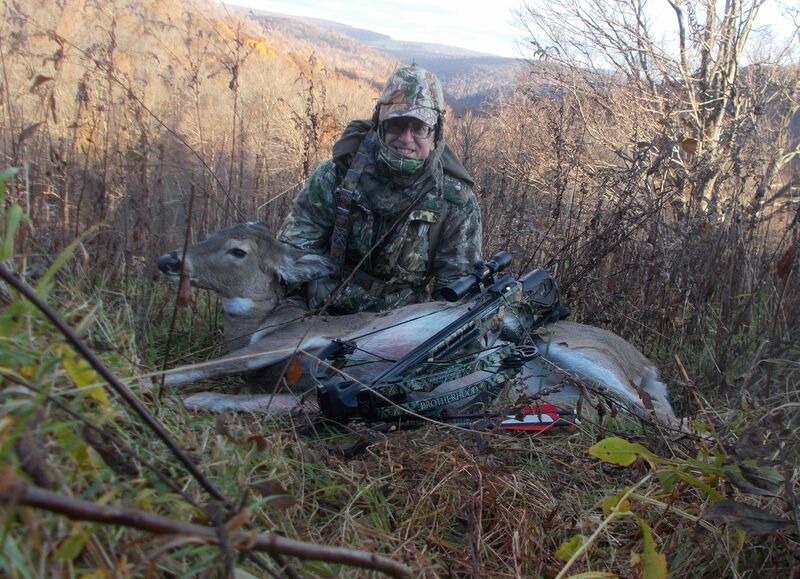 I am off in Maryland until rifle season comes in due to bag limits. I do have a Pennsylvania license and when the weather cools, I may try up there as well! I love the 'hunt' and that doesn't always mean a harvest of a deer. I do enjoy the early mornings, the preparations, the anticipation and all that goes with it. I love the outdoors but even more, I love the One who created the outdoors for us to enjoy! And I especially thank HIm for having His favor on my life this year in the deer woods! Congrats!!! nice doe you'll be eatin good this year Hoss!! Great story, great photos and a great testimony! Congrats!! That is a very nice doe!! 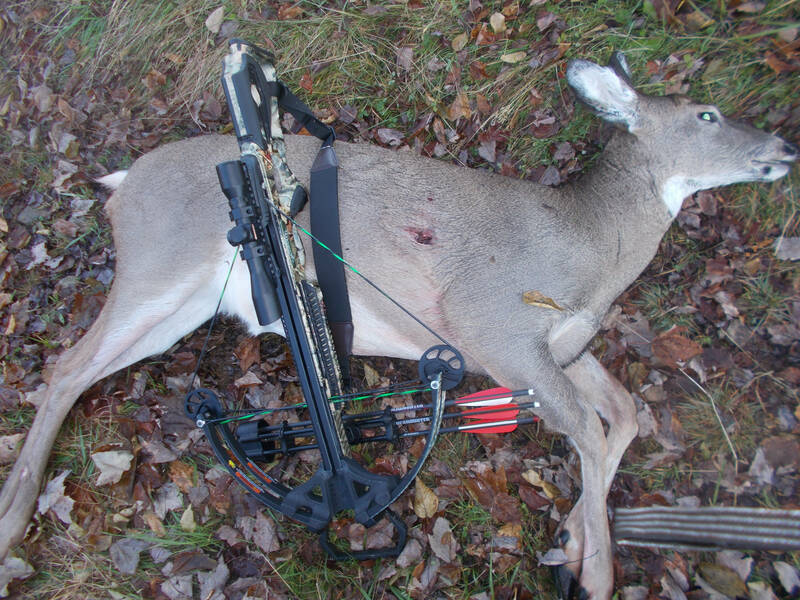 Congrats nice looking doe . Congrats, Bearclaw, you are having a fantastic season! Excellent! You are going to need a bigger freezer at that rate! Congrats Bearclaw. You are having a great year!! Congrats BC, I love the background in the first picture. It looks a lot like the hills around camp. There are a lot of great views from the many Vistas in the mountains.